SAN FRANCISCO | CHICAGO | NEW YORK - Nationally recognized architecture and interior design firm Huntsman Architectural Group announces the opening of a new office in Chicago. 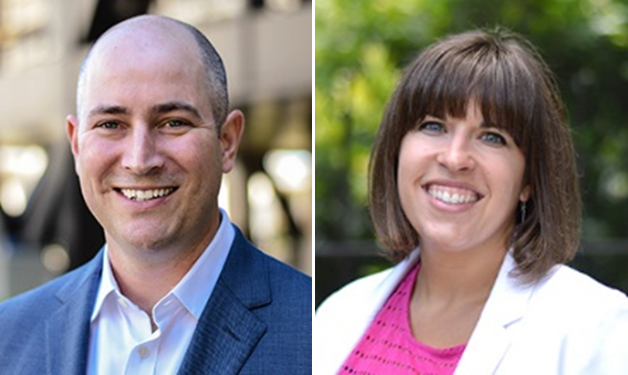 Andrew Volckens, AIA, associate, will be director of the office, and is joined by Karie Vagedes, IIDA, designer; both are long-term employees with the firm. Sascha Wagner, IIDA CID, Huntsman President and CEO made the announcement. “Chicago is a vibrant city with a dynamic business culture. It’s also a city where architecture has always played a significant role,” said Wagner. “With Huntsman’s core focus on giving new life to existing structures, including building renovations, repositioning, and tenant improvements, the firm is ideally suited for expanding into the Chicago market,” he added. Volckens has over 15 years of experience as a designer and licensed architect working on a range of project types, including public sector, higher education, residential, mixed-use, restaurant, and retail. He has worked on all phases of design and technical documentation and is skilled in using 3D visualization programs to clearly communicate design objectives to clients. He has received design awards for NEST House, a model for disaster relief housing with the potential to be used globally. Volckens’ project experience includes the Champaign Public Library in Champaign, IL; corporate offices for Quantcast and Digital Insight in the Bay Area, the lobby renovation at 301 Howard Street in San Francisco for Vanbarton Group, as well as corporate headquarters for YouTube in San Bruno, CA. Originally from Winnetka, IL, Volckens is a graduate of the University of Michigan and received his Masters in Architecture from the UC Berkeley College of Environmental Design. He is a member of the American Institute of Architects (AIA). With over 13 years of experience in the field of architecture and interior design, Vagedes has collaborated with a wide variety of clients in the planning and design of office, retail, civic, and medical environments. Her diverse portfolio and varied experiences help guide thoughtful design choices unique to each client and project type. She has successfully led projects nationwide from initial planning meetings through on-site construction coordination; her client experience includes a national roll out for Google for Entrepreneurs, on-call architectural services for Equity Office Properties at San Francisco’s Market Center buildings, as well as corporate offices for Federal Home Loan Bank in San Francisco and Kaiser Permanente in Chicago. Working for Huntsman from Chicago since 2012, Vagedes takes an active role volunteering at DePaul University mentoring young women through Chi Omega Fraternity. Originally from West Milton, OH, Vagedes is a graduate of the University of Cincinnati Design, Art, Architecture and Planning (DAAP). She is a member of the International Interior Design Association (IIDA).